Exterior of the Ferries and Cliff House Railway Co. Building Constructed in 1887. Houses both the cable car winding station, engines, and museum. 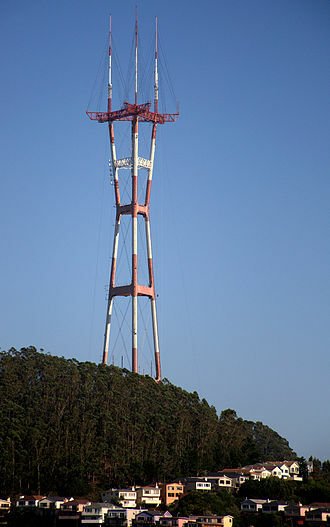 The smoke stack in the rear was damaged in the 1906 San Francisco earthquake, restored then soon decommissioned when steam power was replaced with electrical power at the winding station. A 2010 photograph of the power house. The signs above each of the three cables ("California", "Mason", "Powell") show which line it is driving. The Cable Car Museum is a free museum in the Nob Hill neighborhood of San Francisco, California. Located at 1201 Mason Street, it contains historical and explanatory exhibits on the San Francisco cable car system, which can itself be regarded as a working museum. The museum is part of the complex that also houses the cable car power house, which drives the cables, and the car depot ("barn"). The car depot is not open to the public, but two overlook galleries allow the visitor to view the power house, and to descend below the junction of Washington and Mason streets in order to view the large cavern where the haulage cables are routed via large sheaves out to the street. The museum was established in 1974, and is run by the Friends of the Cable Car Museum. It is entered from an entrance at Washington and Mason and is open from 10 AM to 6 PM between April 1 and September 30 and from 10 AM to 5 PM between October 1 and March 31, apart from some public holidays. The museum main level is wheelchair accessible via a separate entrance. The admission to the museum is free. ^ a b "Cable Car Museum Review". Fodors Travel. Retrieved 2008-07-01. ^ a b c "About the San Francisco Cable Car Museum". Friends of the Cable Car Museum. Retrieved 2008-07-01. This article about a building or structure in San Francisco is a stub. You can help Wikipedia by expanding it. 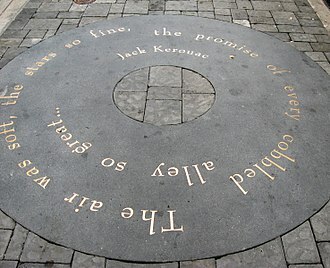 The Castro District, commonly referenced as The Castro, is a neighborhood in Eureka Valley in San Francisco. The Castro was one of the first gay neighborhoods in the United States, San Franciscos gay village is mostly concentrated in the business district that is located on Castro Street from Market Street to 19th Street. It extends down Market Street toward Church Street and on sides of the Castro neighborhood from Church Street to Eureka Street. 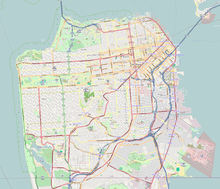 Some consider it to include Duboce Triangle and Dolores Heights, which both have a strong LGBT presence and it reappears in several discontinuous sections before ultimately terminating at Chenery Street, in the heart of Glen Park. Castro Street was named for José Castro, a Californian leader of Mexican opposition to U. S. rule in California in the 19th century, and alcalde of Alta California from 1835 to 1836. The neighborhood now known as the Castro was created in 1887 when the Market Street Railway Company built a line linking Eureka Valley to downtown. 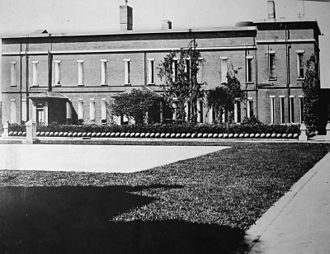 In 1891, Alfred E. Clarke built his mansion at the corner of Douglass and it survived the 1906 earthquake and fire which destroyed a large portion of San Francisco. 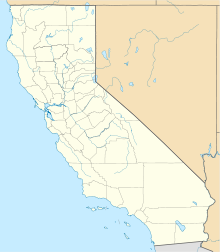 Up to the 19th century, the possession of the Russian Empire in North America included the modern-day U. S. State of Alaska and settlements in the modern-day U. S. states of California. 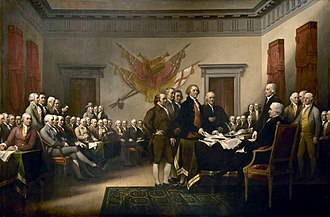 These Russian possessions were collectively and officially referred to by the name Russian America from 1733 to 1867, formal incorporation of the possessions by Russia did not take place until the establishment of the Russian-American Company in 1799. At the time, Russia was a young naval power. From the start, in 1840–1865, three consecutive Finnish pastors served this pastorate, Uno Cygnaeus, Gabriel Plathán and Georg Gustaf Winter, the Finns Aaron Sjöstrom and Otto Reinhold Rehn served as the parish organists/sextons during the same period. In 1841, under the governorship of Russian America by Finnish Arvid Adolf Etholén, during the final three decades of the existence of Russian America, Finnish Chief Managers of Russian America included Arvid Adolf Etholén in 1840–1845 and Johan Hampus Furuhjelm in 1859–1864. A third Finn, Johan Joachim von Bartram, declined the offer for the term between 1850 and 1855. All three were high ranking Imperial naval officers, in reference to San Francisco, researcher Maria J. Enckell states the following about the Finns in the Russian-American Company, Russia relied heavily on Finnish seamen. These seamen manned Russian naval ships as well as its deep-sea-going vessels, Company records show that in the early 1800s these ships were crewed predominantly by merchant seamen from Finland. From 1840 onward the Companys around-the-world ships were manned entirely by Finnish merchant skippers, Most Company ships stationed in Sitka and the Northern Pacific were likewise manned by Finnish skippers and Finnish crews. 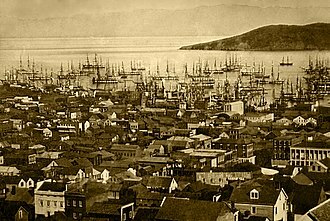 During the California Gold Rush and in its aftermath, a substantial Finnish population had settled in San Francisco, Kalevalas visit in the city received a very warm welcome and created much attention. In addition to the Finnish-built corvette Kalevala now returning to the U.
Fort Point is a masonry seacoast fortification located at the southern side of the Golden Gate at the entrance to San Francisco Bay. This fort was completed just before the American Civil War by the United States Army, the fort is now protected as Fort Point National Historic Site, a United States National Historic Site administered by the National Park Service as a unit of the Golden Gate National Recreation Area. In 1769 Spain occupied the San Francisco area and by 1776 had established the areas first European settlement, with a mission and a presidio. To protect against encroachment by the British and Russians, Spain fortified the high white cliff at the narrowest part of the bays entrance, the Castillo de San Joaquin, built in 1794, was an adobe structure housing nine to thirteen cannons. 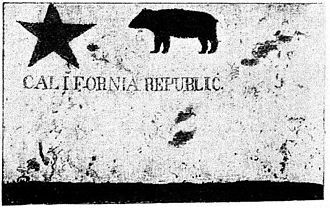 Mexico won independence from Spain in 1821, gaining control of the region and the fort, following the United States victory in 1848, California was annexed by the U. S. and became a state in 1850. 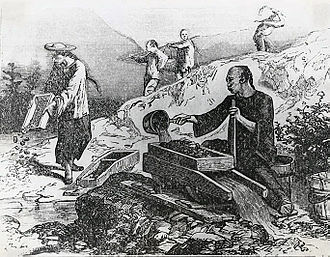 The gold rush of 1849 had caused rapid settlement of the area, military officials soon recommended a series of fortifications to secure San Francisco Bay. 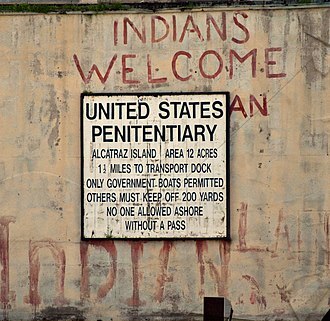 Coastal defenses were built at Alcatraz Island, Fort Mason, the U. S. Army Corps of Engineers began work on Fort Point in 1853. 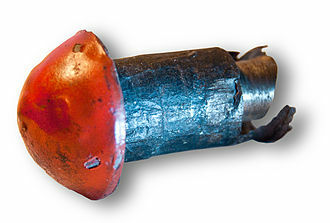 Plans specified that the lowest tier of artillery be as close as possible to water level so cannonballs could ricochet across the surface to hit enemy ships at the water-line. Workers blasted the 90-foot cliff down to 15 feet above sea level, the structure featured seven-foot-thick walls and multi-tiered casemated construction typical of Third System forts. It was sited to defend the maximum amount of harbor area, while there were more than 30 such forts on the East Coast, Fort Point was the only one on the West Coast. In 1854 Inspector General Joseph K. Mansfield declared this point as the key to the whole Pacific Coast. a crew of 200, many unemployed miners, labored for eight years on the fort. In 1861, with war looming, the army mounted the forts first cannon, colonel Albert Sidney Johnston, commander of the Department of the Pacific, prepared Bay Area defenses and ordered in the first troops to the fort. The F Market & Wharves line is one of several light rail lines in San Francisco, California. Despite its heritage status, the F Market & Wharves line is an part of Munis intermodal urban transport network, operating at frequent intervals for 20 hours a day. It carries local commuters and tourists alike, linking residential, unlike the San Francisco cable car system, standard Muni fares are levied. The streetcar line was discontinued in 1951 and was replaced by the 30-Stockton route, the F-line designation was therefore available for use by the current line, although that service is over a completely different route from the F-line of 1915 to 1951. Market Street is a major artery for the city of San Francisco. In the 1960s construction began on the Market Street Subway, which would carry BARTs trains on its lower level, all streetcar lines currently operating in the subway previously ran on the surface of Market Street, and were eventually diverted into the upper level of the tunnel. This diversion, together with the provision of new rail cars. The diversion of the Market Street streetcar lines into tunnel and the replacement of the existing streetcars with new rail cars was completed by November 1982. However, the trackage on Market Street was retained. In 1982, San Franciscos cable car lines were shut down for almost two years to allow for a major rebuild, to provide an alternative tourist attraction during this period, the San Francisco Historic Trolley Festivals began in 1983. These summertime operations of vintage streetcars on Market Street were a joint project of the San Francisco Chamber of Commerce, the trolley festival route went from the Transbay Terminal at First and Mission Streets to Market, up the retained Market Street tracks to Duboce Avenue. From there, it followed a temporary streetcar detour built in the 1970s to bypass subway construction under Market, Church Street, the Trolley Festival proved so successful it was repeated every year until 1987. In that year, preparation began for the introduction of a permanent F line, after that year’s festival finished, Muni replaced the old Market Street tracks with new ones, restoring tracks to upper Market Street and recreating a line to Castro. The Cliff House is a restaurant perched on the headland above the cliffs just north of Ocean Beach, on the western side of San Francisco, California. 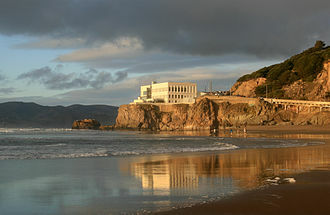 It overlooks the site of the former Sutro Baths and is now part of the Golden Gate National Recreation Area, on the terrace of the Cliff House is a room-sized camera obscura. Cliff House has had five major incarnations since its beginnings in 1858 and that year, Samuel Brannan, a prosperous ex-Mormon elder from Maine, bought for $1,500 the lumber salvaged from a ship that foundered on the basalt cliffs below. With this material he built the first Cliff House, the second Cliff House was built in 1863, and leased to Captain Junius G. Foster. It was a trek from the city and hosted mostly horseback riders. With the opening of the Point Lobos toll road a year later, the builders of the toll road constructed a two-mile speedway beside it where well-to-do San Franciscans raced their horses along the way. On weekends, there was room at the Cliff House hitching racks for tethering the horses for the thousands of rigs. Soon, omnibus and streetcar lines made it to near Lone Mountain where passengers transferred to stagecoach lines to the beach. The growth of Golden Gate Park attracted beach travellers, in search of meals, in 1877, the toll road, now Geary Street, was purchased by the city for around $25,000. After a few years of management by J. M. Wilkens. The blast was heard a hundred miles away and demolished the north wing of the tavern. The building was repaired, but was completely destroyed by fire on Christmas night 1894 due to a defective flue. Wilkens was unable to save the guest register, which included the signatures of three Presidents and dozens of illustrious world-famous visitors and this incarnation of the Cliff House, with its various extensions, had lasted for 31 years. In 1896, Adolph Sutro built a new Cliff House, a seven story Victorian Chateau, called by some the Gingerbread Palace and this was the same year work began on the famous Sutro Baths in a small cove immediately north of the Restaurant. Market Street is a major thoroughfare in San Francisco, California. Beyond this point, the roadway continues as Portola Drive into the southwestern quadrant of San Francisco, Portola Drive extends south to the intersection of St. Francis Boulevard and Sloat Boulevard, where it continues as Junipero Serra Boulevard. Market Street is the boundary of two street grids, Streets on its southeast side are parallel or perpendicular to Market Street, while those on the northwest are nine degrees off from the cardinal directions. Market Street is a major artery for the city of San Francisco, and has carried in turn horse-drawn streetcars, cable cars, electric streetcars, electric trolleybuses. Today Munis buses and heritage streetcars share the street, while below the street the two-level Market Street Subway carries Muni Metro and Bay Area Rapid Transit. While cable cars no longer operate on Market Street, the cable car lines terminate to the side of the street at its intersections with California Street. Market Street cuts across the city for three miles from the waterfront to the hills of Twin Peaks and it was laid out originally by Jasper OFarrell, a 26-year-old trained civil engineer who emigrated to Yerba Buena. 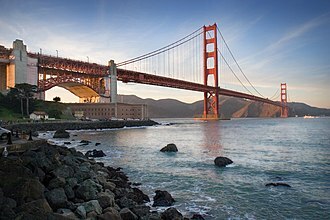 The town was renamed San Francisco in 1847 after it was captured by United States troops during the Mexican-American War, OFarrell first repaired the original layout of the settlement around Portsmouth Square and established Market Street as the widest street in town,120 feet between property lines. It was described at the time as an arrow aimed straight at Los Pechos de la Chola, a friend warned OFarrell, before the crowd had dispersed. 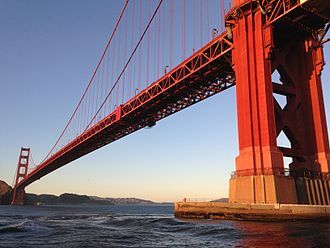 He rode with all haste to North Beach, took a boat for Sausalito and he found it discreet to remain some time in the country before venturing to return to the city. 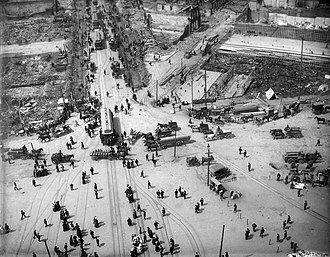 The city soon filled in the ground between Portsmouth Square and Happy Valley at First and Mission Street, the dunes were leveled and the sand used for fill. The first horsecar-powered railway line to open in San Francisco commenced running down the thoroughfare on July 4,1860, the two Union Railroad tracks were on the inside and the two San Francisco Municipal Railway tracks were on the outside. In 1892 The Owl Drug Company was established at 1128 Market Street, Market Street underwent major changes in the late 1960s and early 1970s, when Muni Metro service was moved underground in concert with the development of the Bay Area Rapid Transit system. Construction of the Market Street Subway commenced in July 1967, prolonged disruption to what had traditionally been the social and economic center of the city contributed to the decline of the mid-Market shopping district in years. In 1980, Munis surface operations were partially routed underground with full service changes occurring in 1982, in the days of the first United Nations conferences, Anthony Eden, Molotov and Bidault rode up Market Street, waving to the crowds of hopefuls. On Christmas Eve 1910, opera singer Luisa Tetrazzini sang a free concert to a crowd some estimated at 250,000. Another historic Market Street event was the New Years Eve celebration at the Ferry Building on December 31,1999, over 1.2 million people jammed Market Street and nearby streets for the raucous and peaceful turn-of-the-century celebration. 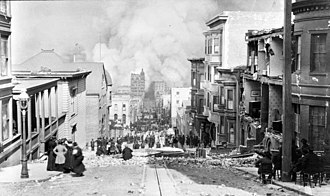 The 1906 San Francisco earthquake struck the coast of Northern California at 5,12 a. m. on April 18 with an estimated moment magnitude of 7.8 and a maximum Mercalli intensity of XI. Severe shaking was felt from Eureka on the North Coast to the Salinas Valley, devastating fires soon broke out in the city and lasted for several days. 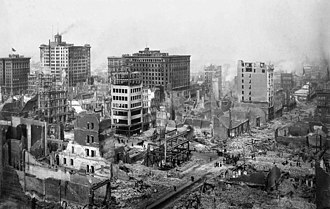 As a result, about 3,000 people died and over 80% of the city of San Francisco was destroyed, the events are remembered as one of the worst and deadliest natural disasters in the history of the United States. The death toll remains the greatest loss of life from a disaster in Californias history. The San Andreas Fault is a transform fault that forms part of the tectonic boundary between the Pacific Plate and the North American Plate. The strike-slip fault is characterized by mainly lateral motion in a dextral sense, the 1906 rupture propagated both northward and southward for a total of 296 miles. This fault runs the length of California from the Salton Sea in the south to Cape Mendocino in the north, the maximum observed surface displacement was about 20 feet, geodetic measurements show displacements of up to 28 feet. The 1906 earthquake preceded the development of the Richter magnitude scale by three decades. The most widely accepted estimate for the magnitude of the quake on the moment magnitude scale is 7.8. According to findings published in the Journal of Geophysical Research, severe deformations in the earths crust took place both before and after the earthquakes impact. Accumulated strain on the faults in the system was relieved during the earthquake, the main shock epicenter occurred offshore about 2 miles from the city, near Mussel Rock. Shaking was felt from Oregon to Los Angeles, and inland as far as central Nevada, a strong foreshock preceded the main shock by about 20 to 25 seconds. 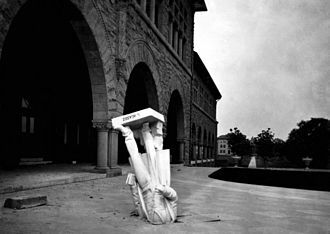 The strong shaking of the main shock lasted about 42 seconds, there were decades of minor earthquakes – more than at any other time in the historical record for northern California – before the 1906 quake. For years, the epicenter of the quake was assumed to be near the town of Olema, in the Point Reyes area of Marin County, because of evidence of the degree of local earth displacement. The Sutro Baths were a large, privately owned public saltwater swimming pool complex in the Lands End area of the Outer Richmond District in western San Francisco, California. 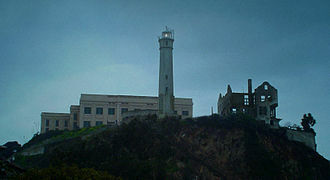 Built in 1896, it was located near the Cliff House, Seal Rock, the facility burned down in June 1966 and is now in ruins. The site is within the Golden Gate National Recreation Area and the Sutro Historic District, on March 14,1896, the Sutro Baths were opened to the public as the worlds largest indoor swimming pool establishment. The baths were built on the side of San Francisco by wealthy entrepreneur. The structure was situated in a small beach inlet below the Cliff House, both the Cliff House and the former baths site are now a part of the Golden Gate National Recreation Area, operated by the United States National Park Service. The baths struggled for years, mostly due to the high operating. Shortly after closing, a fire in 1966 destroyed the building while it was in the process of being demolished, all that remains of the site are concrete walls, blocked off stairs and passageways, and a tunnel with a deep crevice in the middle. The cause of the fire was determined to be arson, shortly afterwards, the developers left San Francisco and claimed insurance money. Media is stored by the Library of Congress as part of the American Memory collection and available for viewing online, Sutro Baths, no.1 and Sutro Baths,2, filmed in 1897 by Thomas A. Edison, Inc. Panoramic view from an engine on the Ferries and Cliff House Railroad line route along the cliffs of Lands End, starting at the Sutro Baths depot, filmed in 1902 by Thomas A. Edison. Panoramic view from the beach below Cliff House at Sutro Baths, filmed in 1903 by American Mutoscope, the following statistics are from a 1912 article written by J. E. Van Hoosear of Pacific Gas and Electric. Materials used in the structure included 100,000 sq ft of glass,600 tons of iron,3,500,000 board feet of lumber, and 10,000 cu yd of concrete. The baths were once serviced by a line, the Ferries and Cliff House Railroad. The route ran from the baths to a terminal at California Street, during high tides, water would flow directly into the pools from the nearby ocean, recycling the two million US gallons of water in about an hour. The Ferry Building, along the Embarcadero. Market Street is conspicuous in the view from Twin Peaks. An F Market streetcar turns at the foot of Market Street, in front of the Ferry Building. Market Street, pictured on a postcard, c.1900. At the near left, the Flood Building at Powell Street. The Emporium is to the right. The original adobe Mission structure is the smaller building at left, while the larger structure is a basilica completed in 1918 (the architectural style was influenced by designs exhibited at San Diego's Panama-California Exposition in 1915). 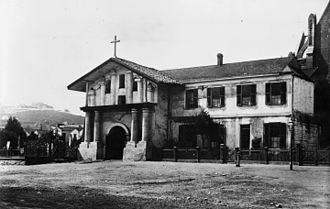 Mission San Francisco de Asís around 1910. The wooden addition has been removed and a portion of the brick Gothic Revival church is visible at right. The large stone church was severely damaged in the 1906 earthquake.